OTTAWA — The Ottawa Redblacks acquired J.C. Beaulieu from the Montreal Alouettes for Pat Lavoie in a swap of Canadian fullbacks Tuesday. Beaulieu, 27, of Trois-Rivieres, Que., has played four seasons with Montreal. He appeared in 10 games last season, rushing for 91 yards and a TD. "Pat has been an integral part of the Redblacks from Day 1 and our franchise would not have accomplished as much as we have if not for his contributions," GM Marcel Desjardins said in a statement. "We wish him the best in Montreal. "We are also excited to acquire J.C. Beaulieu and look forward to seeing him on the field as a member of the Redblacks." Lavoie, 30, of Sainte-Flavie, Que., spent four seasons with Ottawa after playing his first two years with Montreal. Lavoie was a member of the Redblacks Grey Cup-winning team in 2016 before registering 35 catches for 280 yards last season. "We are very happy to bring Patrick back home, where it all started for him," said Montreal GM Kavis Reed. 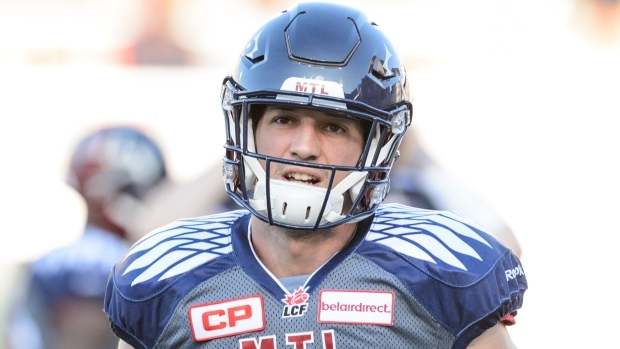 "Since he arrived in the CFL, he has been a consistent and versatile player. "He will fit very well in our new offensive system. We would like to thank Jean-Christophe for being so dedicated to the Alouettes on the field as much as in the community. We wish him all the best."